PROVIDENCIALES, Turks and Caicos, (Reuters) – Residents of the Turks and Caicos Islands yesterday hunkered down for Hurricane Irma, which has smashed through a string of Caribbean islands as one of the most powerful Atlantic storms in a century, killing at least 14 people en route to Florida. With winds of around 185 miles per hour (290 km per hour), the storm the size of France has ravaged small islands in the northeast Caribbean in recent days, including Barbuda, Saint Martin and the British and U.S. Virgin Islands, ripping down trees and flattening homes and hospitals. Winds dipped yesterday to 175 mph as the Irma soaked the northern coasts of the Dominican Republic and Haiti and brought hurricane-force wind to the Turks and Caicos Islands. It remained an extremely dangerous Category 5 storm, the highest designation by the National Hurricane Center (NHC). Irma was about 40 miles (65 km) south of Turks and Caicos and was expected to reach the Bahamas later yesterday before moving to Cuba and plowing into southern Florida as a very powerful Category 4 on Sunday, with storm surges and flooding due to begin within the next 48 hours. Across the Caribbean authorities rushed to evacuate tens of thousands of residents and tourists in the path of the storm, while on islands in its wake, shocked locals tried to comprehend the extent of the devastation while simultaneously preparing for another major hurricane, Jose, currently a Category 3 and due to hit the northeastern Caribbean on Saturday. 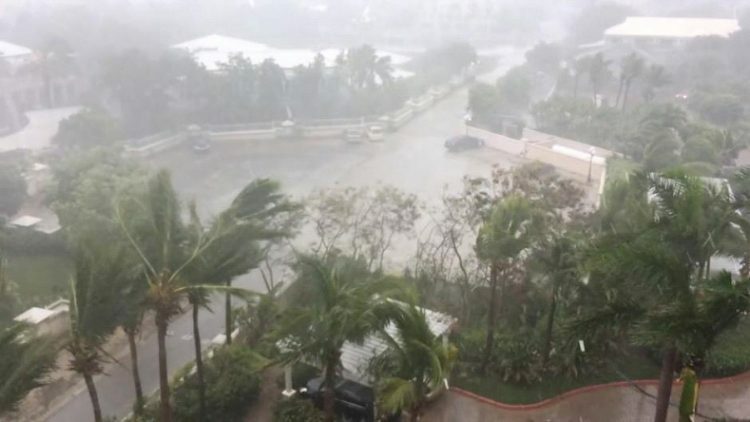 It was the first time the Turks and Caicos islands had experienced a Category 5 storm, said Virginia Clerveaux, director of Disaster Manage-ment and Emergencies. 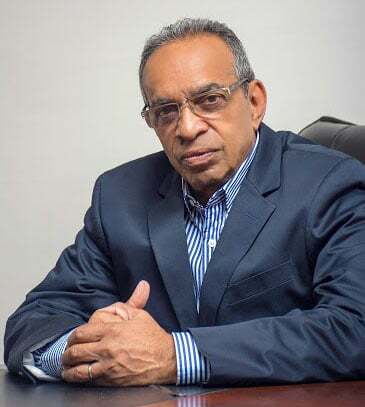 “We are expecting inundation from both rainfall as well as storm surge. And we may not be able to come rescue them in a timely manner,” she said in comments broadcast on Facebook. The few tourists who remained on the Turks and Caicos islands were in hotels, as were some locals. Florida emergency management officials began evacuations, ordering tourists to leave the Keys. 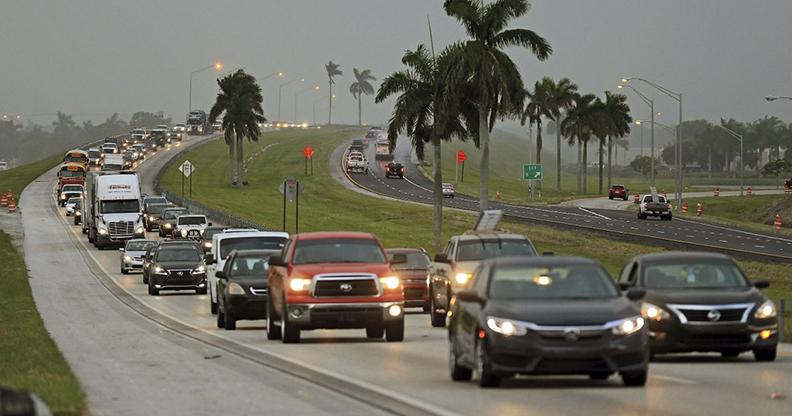 Gas shortages in the Miami-Fort Lauderdale area worsened yesterday, with sales up to five times the norm. In Miami, hundreds of people lined up for bottled water and cars looped around city blocks to get gas in panicked preparations for Irma. “To the people of Florida, we just want you to protect yourselves, be very very vigilant and careful,” said U.S. President Donald Trump, who owns the waterfront Mar-a-Lago estate in Palm Beach, Florida as well as a property on the French side of Saint Martin, an island devastated by the storm. A mandatory evacuation on Georgia’s Atlantic coast was due to begin on Saturday, Governor Nathan Deal said. In the U.S. Virgin islands, four people died, a government spokesman said, and a major hospital was badly damaged by the wind. A U.S. amphibious assault ship arrived in the U.S. Virgin Islands on Thursday and sent helicopters for medical evacuations from the destroyed hospital. 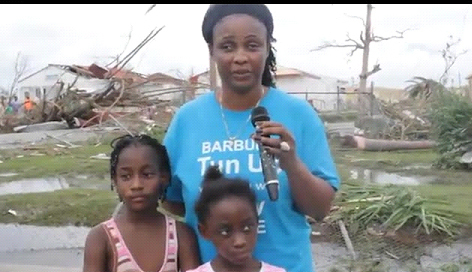 Barbuda, where one person died, was reduced “to rubble”, according to Prime Minister Gaston Browne. In the British overseas territory of Anguilla another person was killed, while the hospital and airport, power and phone services were damaged, emergency service officials said. French Prime Minister Edouard Philippe said four bodies were recovered on the tiny French-Dutch island of Saint Martin, which was hit hard. “It is an enormous disaster. 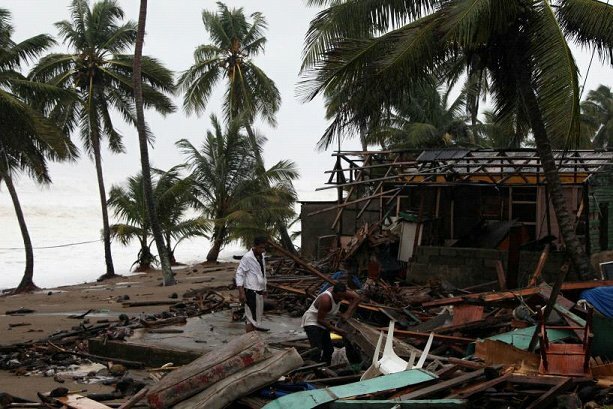 Ninety-five percent of the island is destroyed. 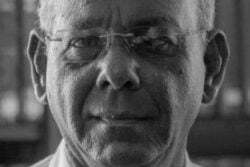 I am in shock,” Daniel Gibbs, chairman of a local council on Saint Martin, told Radio Caribbean International. Television footage from the island showed a damaged marina with boats tossed into piles, submerged streets and flooded homes. French President Emmanuel Macron spoke with British Prime Minister Theresa May yesterday to coordinate an emergency humanitarian response. 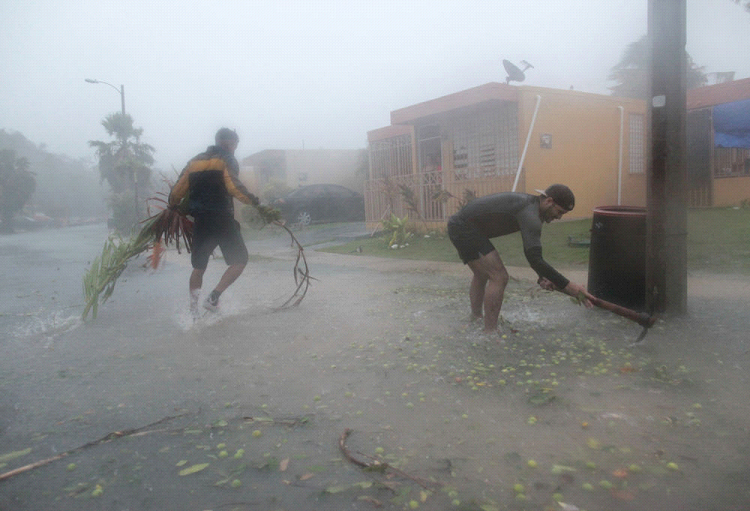 Three people were killed in Puerto Rico and around two-thirds of the population lost their electricity, Governor Ricardo Rossello said after the storm rolled by the U.S. territory’s northern coast. A surfer was also reported killed in Barbados. The storm passed just to the north of the Hispaniola island shared by Dominican Republic and Haiti, causing some damage to roofs, flooding and power outages as it approached the impoverished Haitian side of the island, which is particularly vulnerable to hurricanes and rain, although it did not make landfall. While the strongest winds should not hit Haiti, authorities and aid agencies were bracing for heavy rainfall from the storm just 90 miles (145 km) north of the coast, which could cause deadly landslides and flooding. Cuba started evacuating some of the 51,000 tourists visiting the island, particularly 36,000 people at resorts on the picturesque northern coast. That included all Canadian tourists, who Cuban Tourism Minister Manuel Marrero estimated made up 60 percent of foreign visitors in the country’s keys. In Caibarien, a town in the hurricane’s predicted path, residents secured roofs with sandbags. Irma was the strongest hurricane ever recorded in the Atlantic Ocean and one of the five most forceful storms to hit the Atlantic basin in 82 years, according to the NHC. The storm activity comes after Harvey claimed about 60 lives and caused property damage estimated to be as much as $180 billion in Texas and Louisiana.